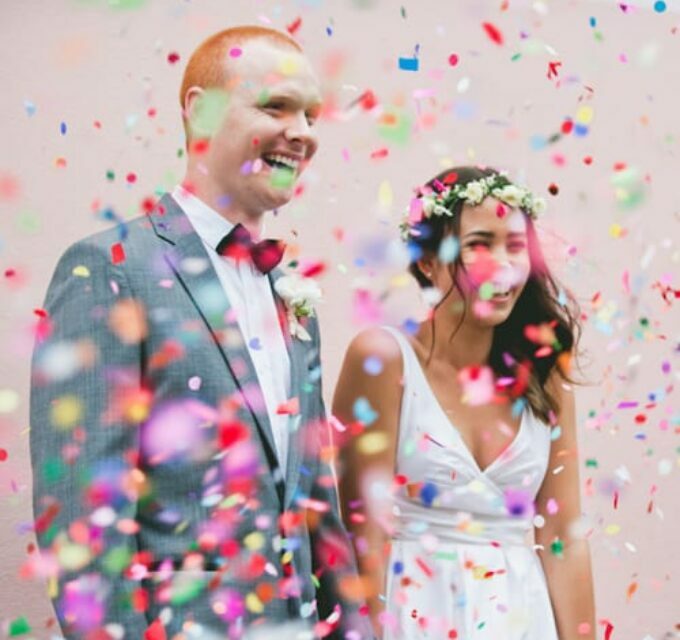 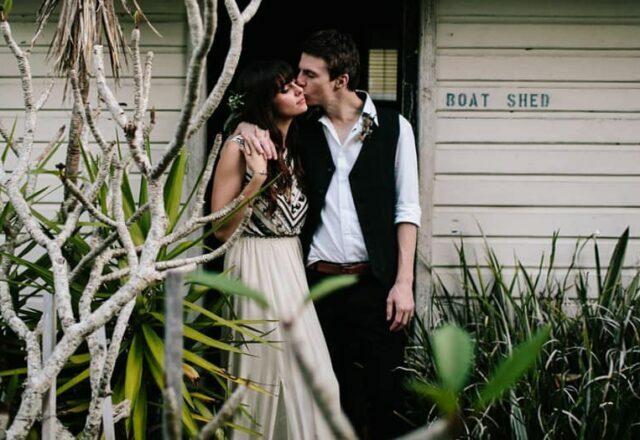 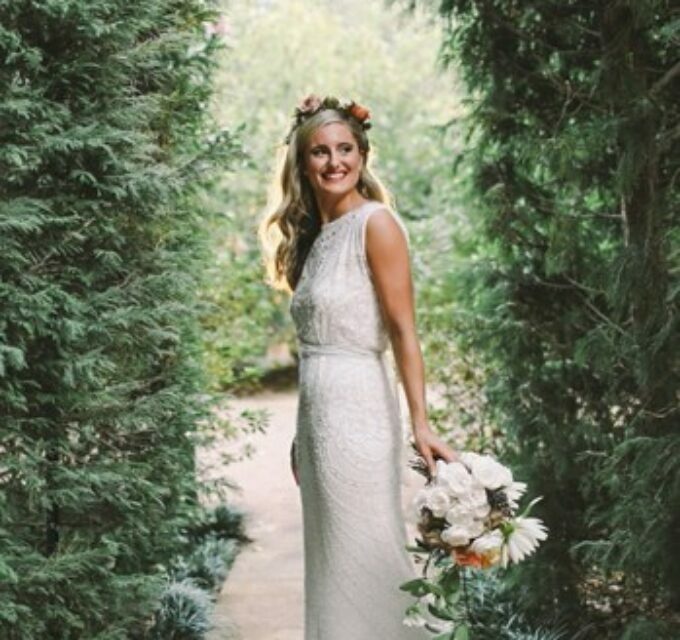 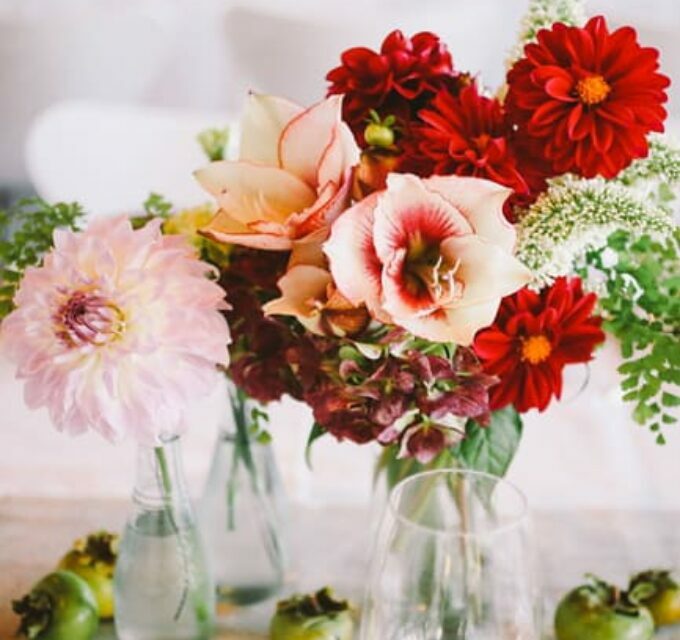 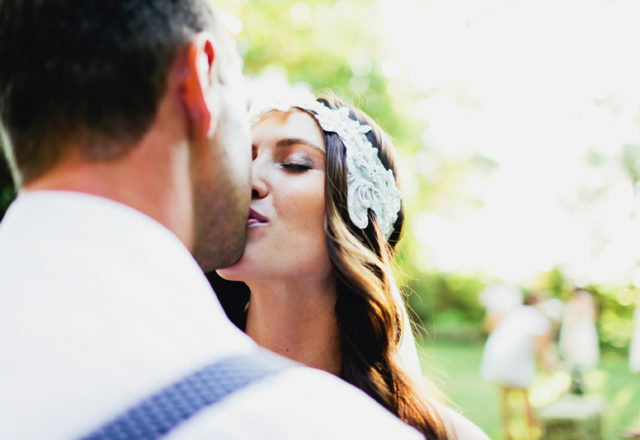 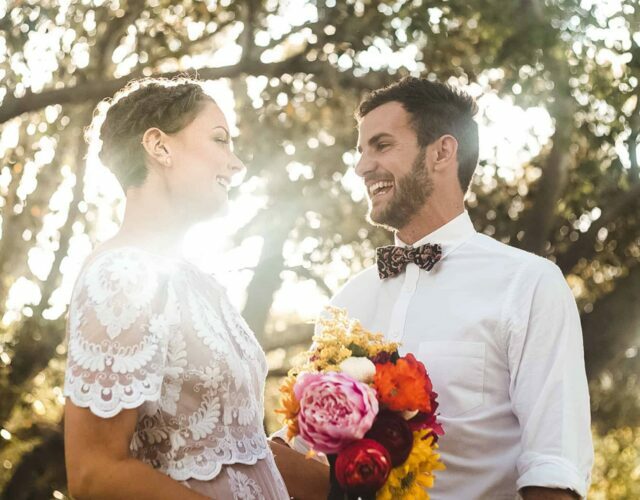 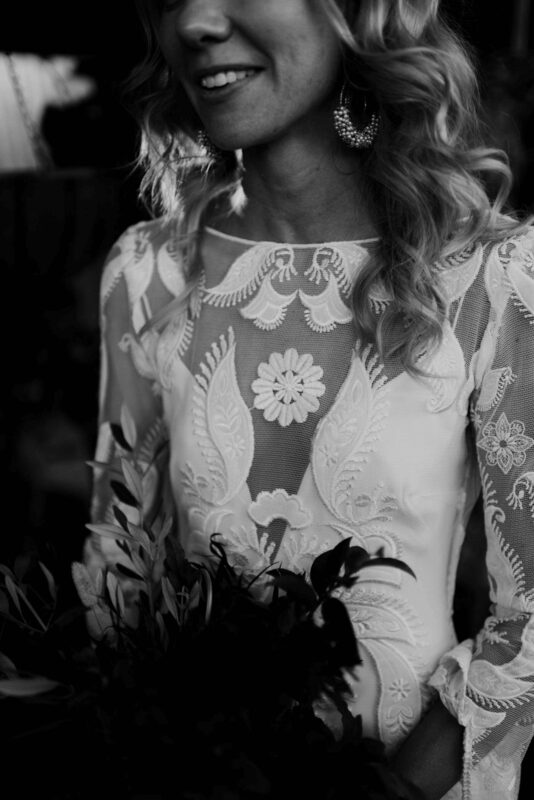 Liz and Justin’s vision was simple – a relaxed garden party wedding with plenty of greenery. 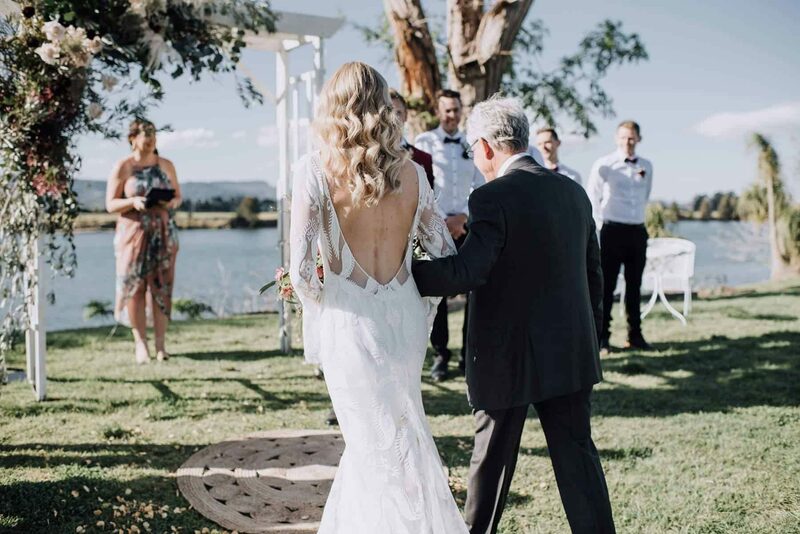 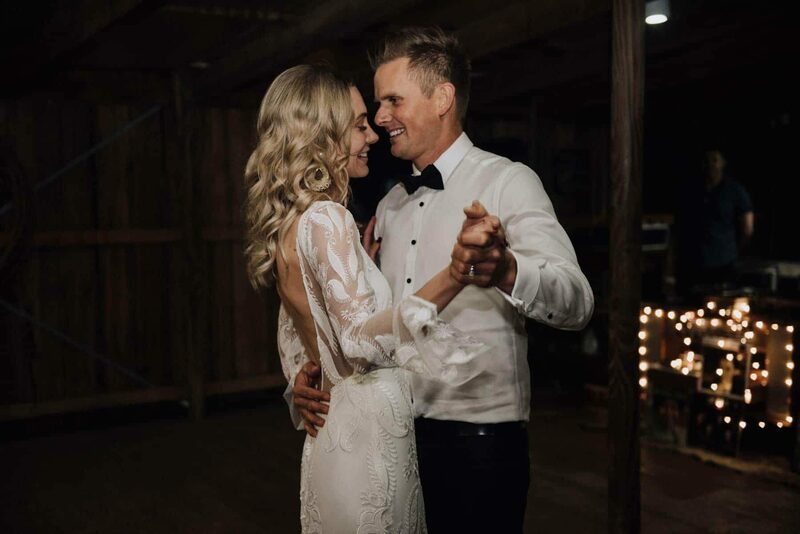 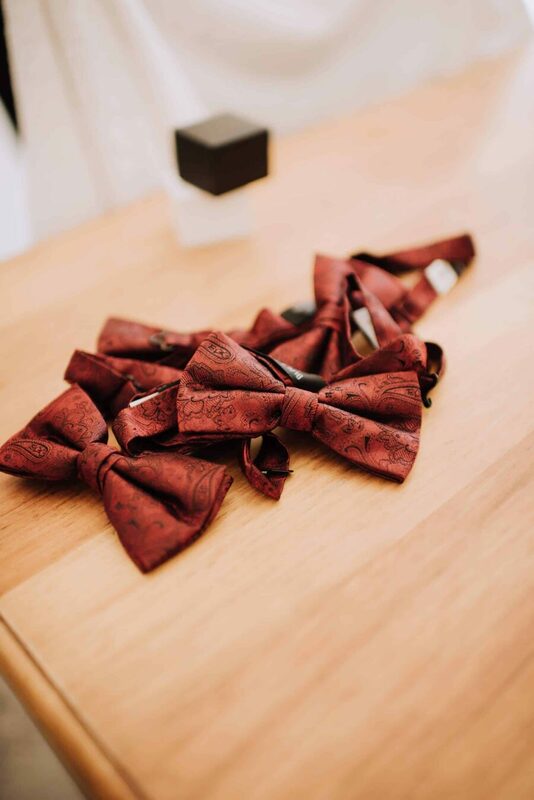 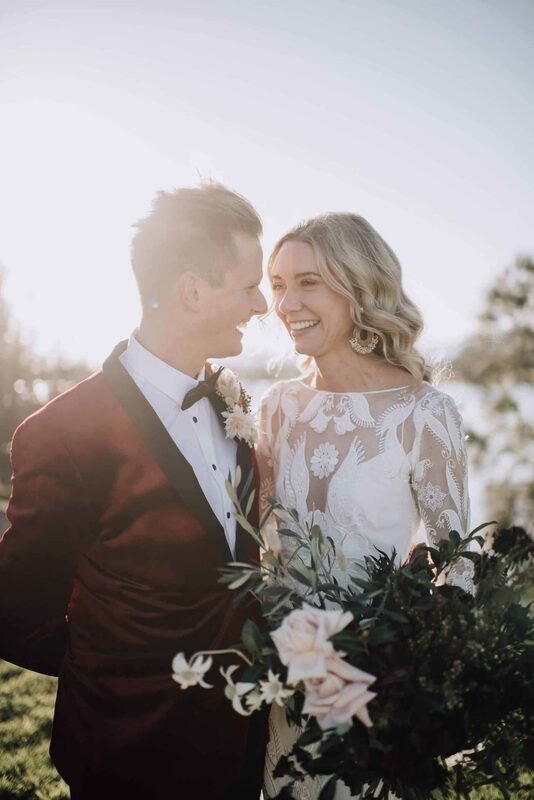 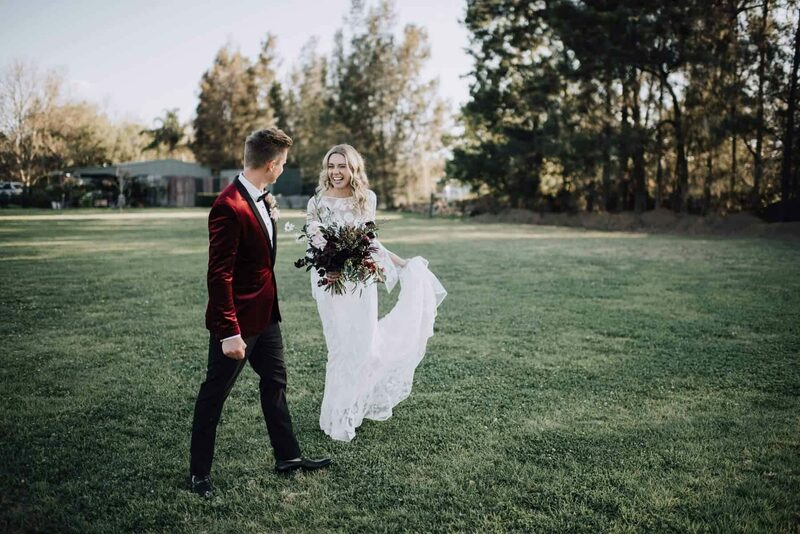 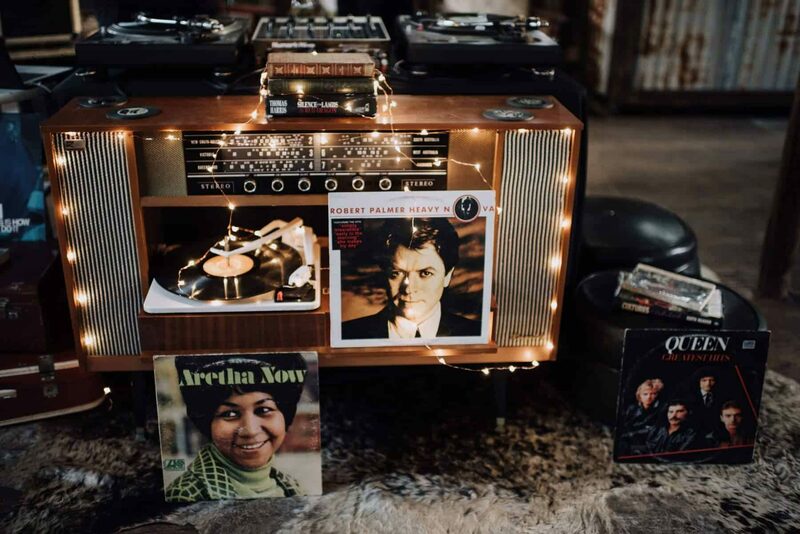 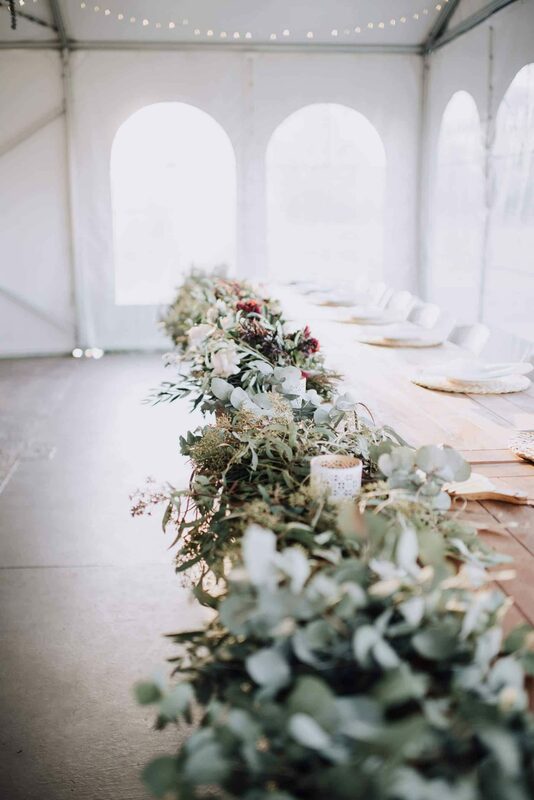 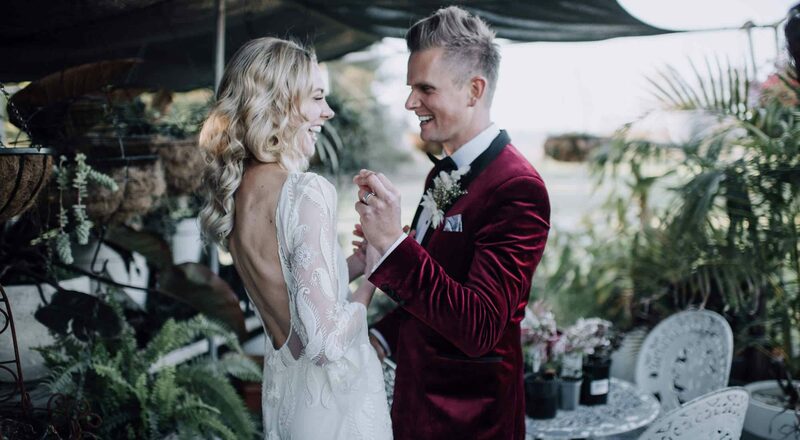 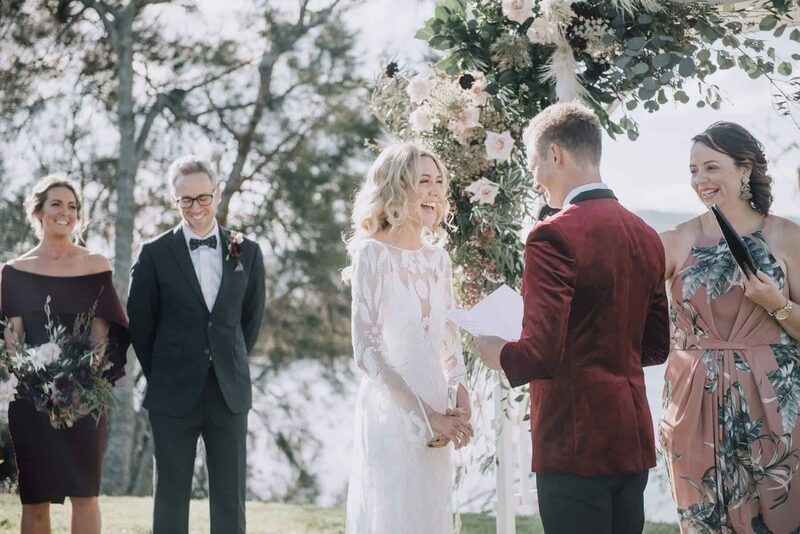 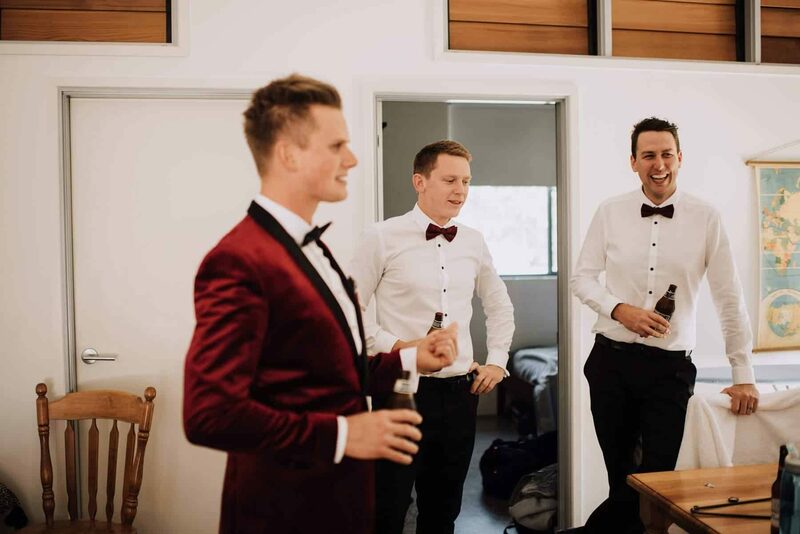 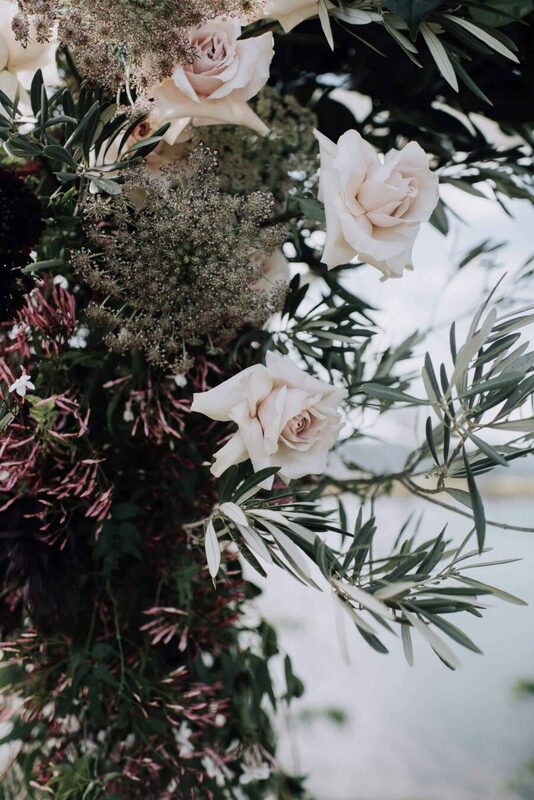 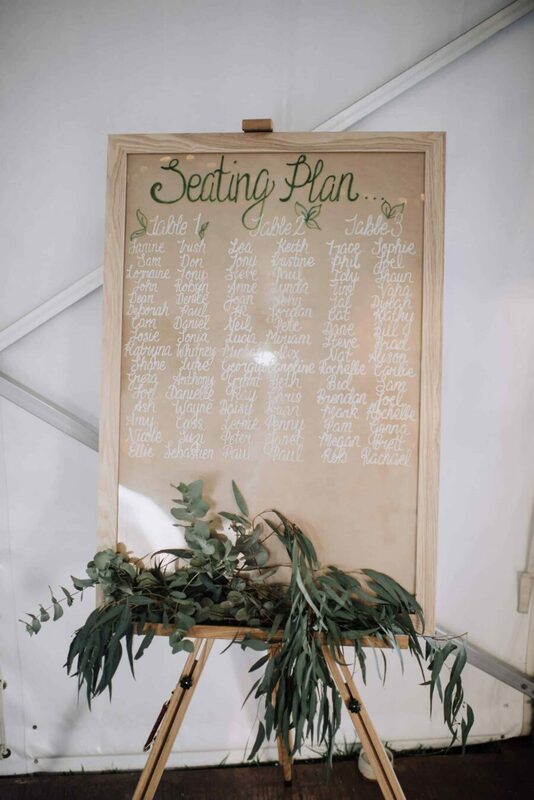 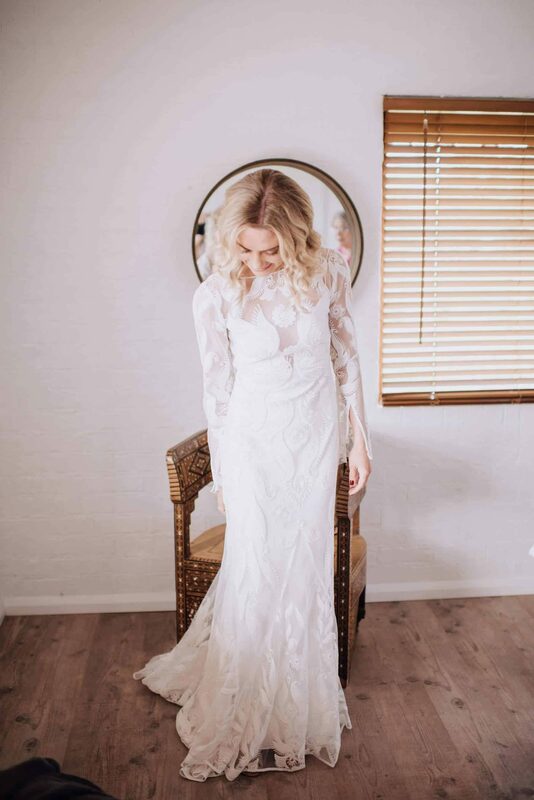 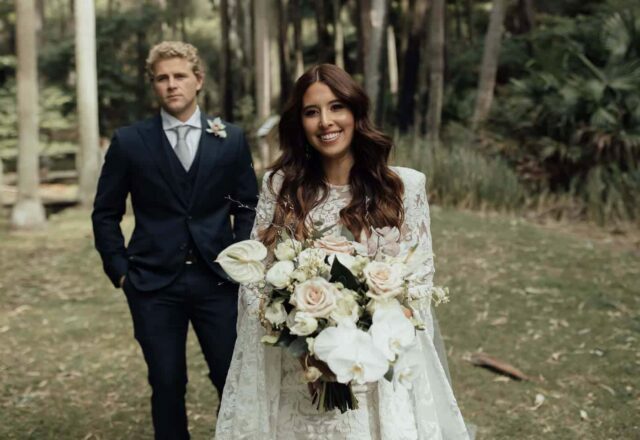 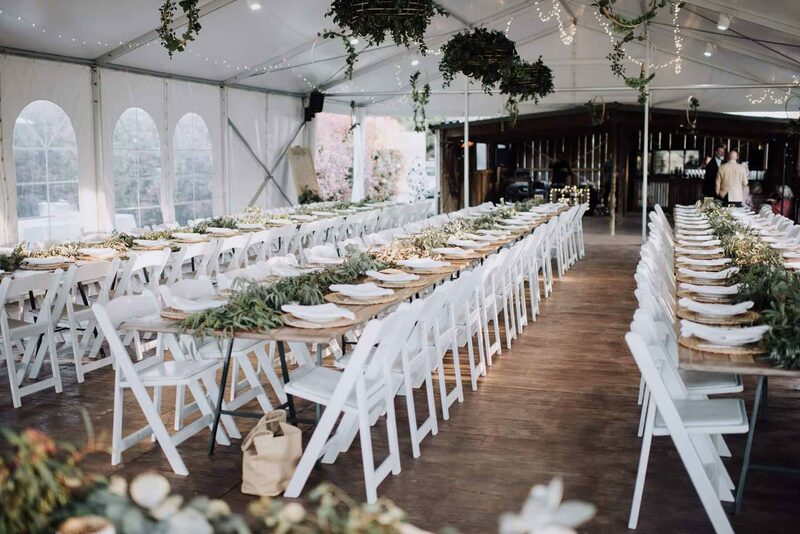 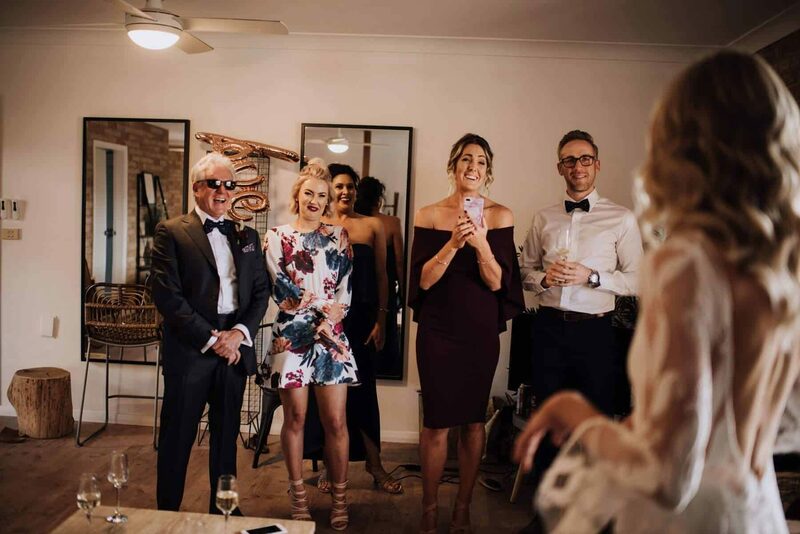 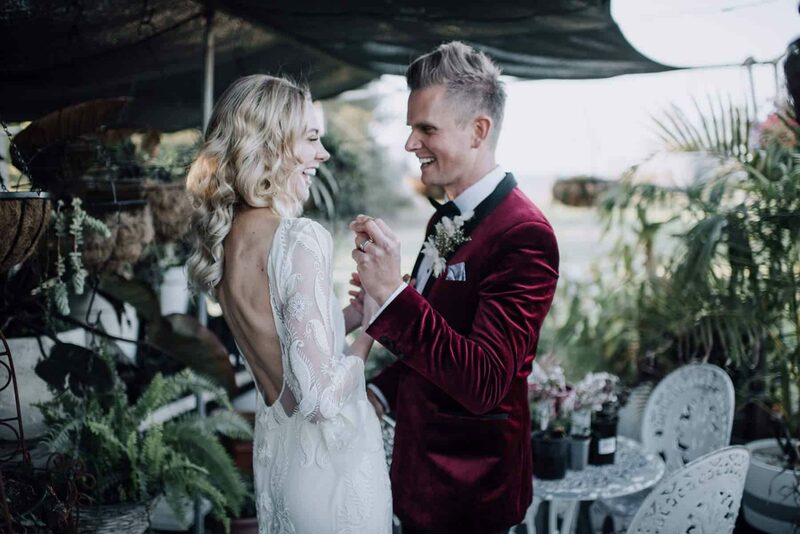 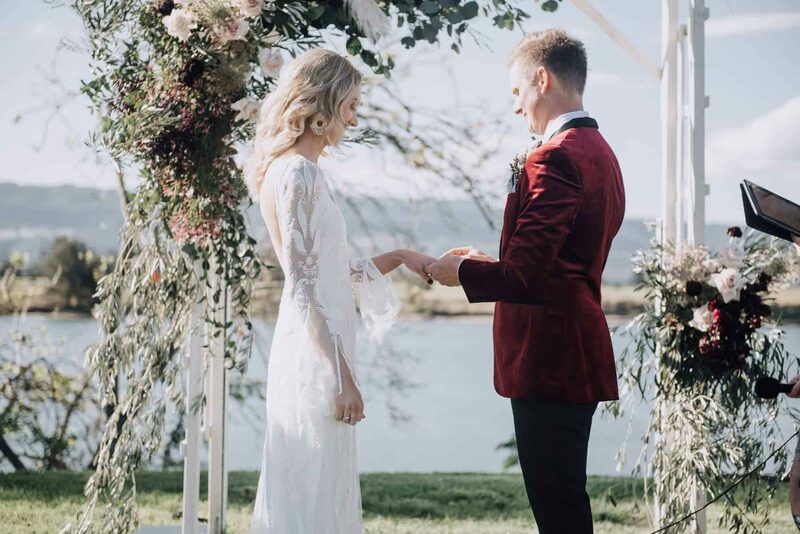 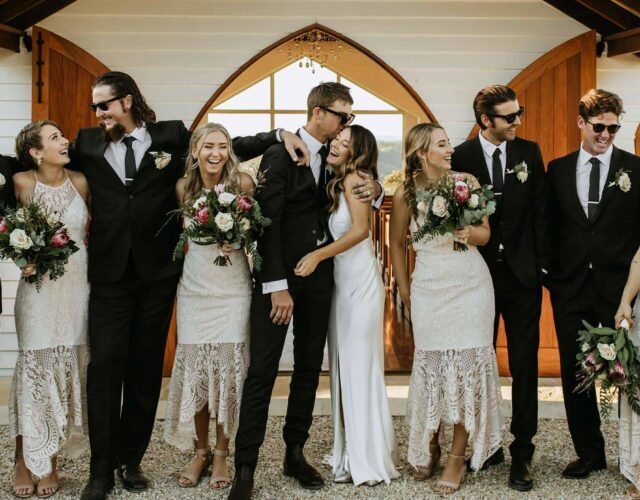 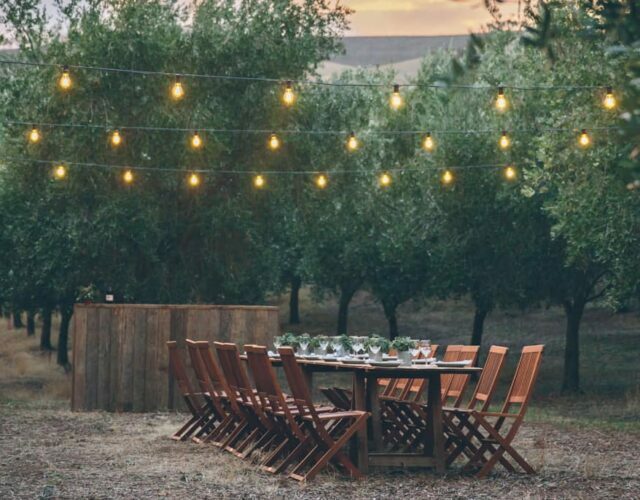 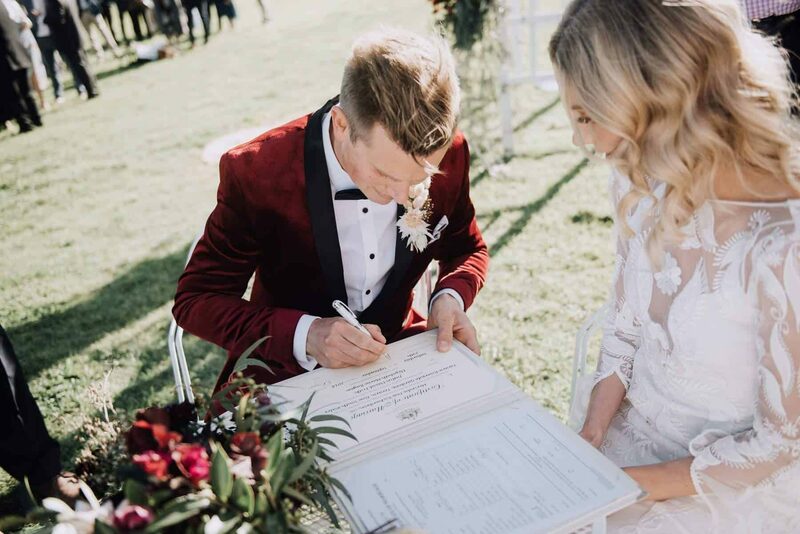 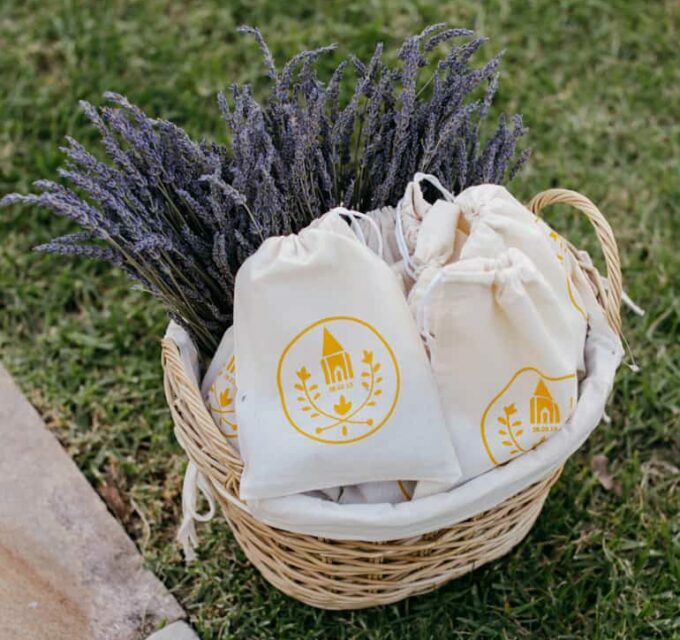 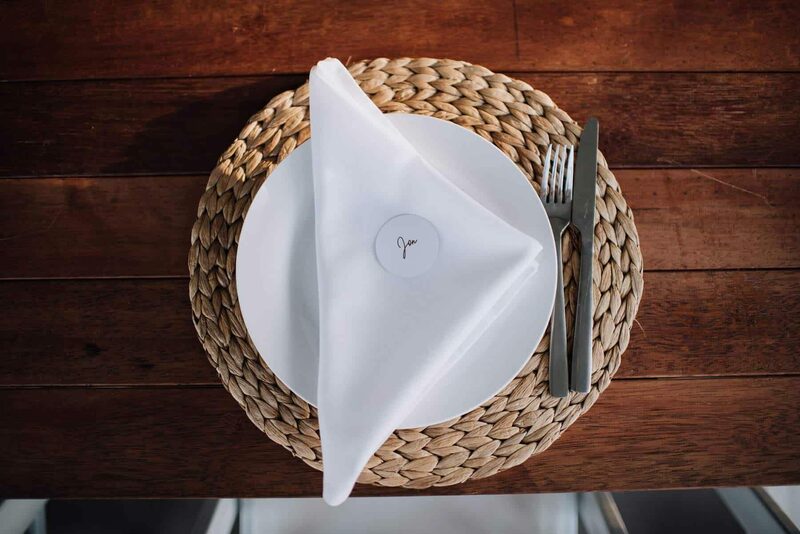 They spotted Terara Riverside Gardens on Instagram and the picturesque South Coast spot proved to be the perfect blank canvas venue for their DIY affair. 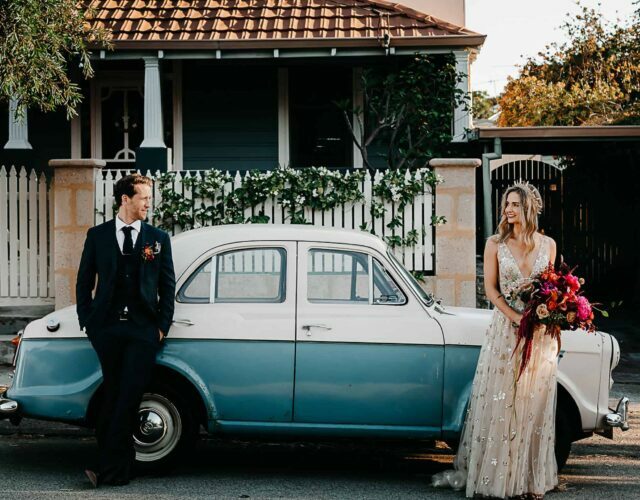 The stylish couple no doubt made the photographer’s job an easy one. 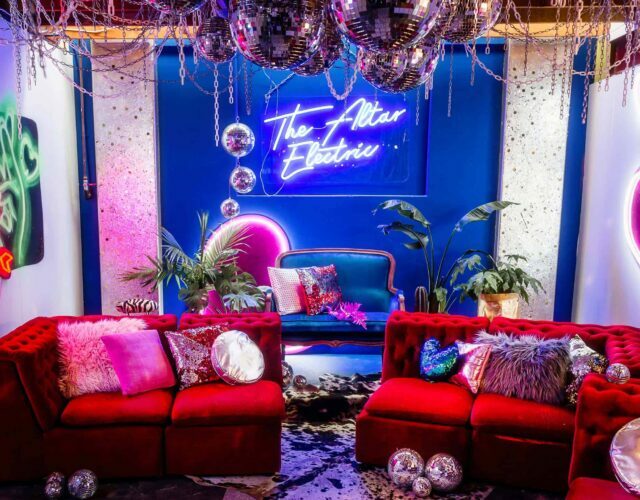 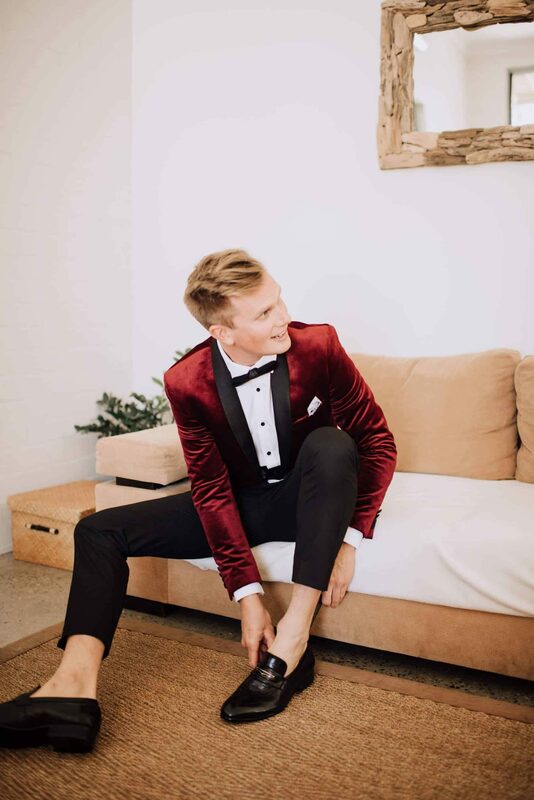 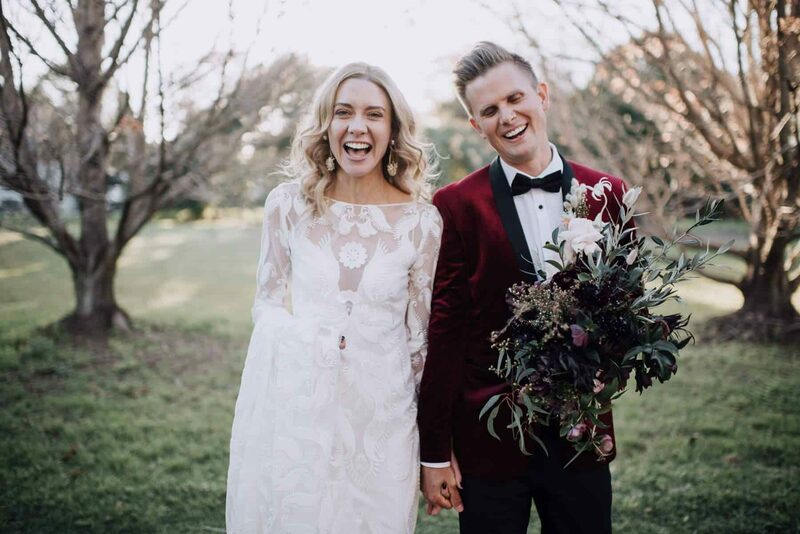 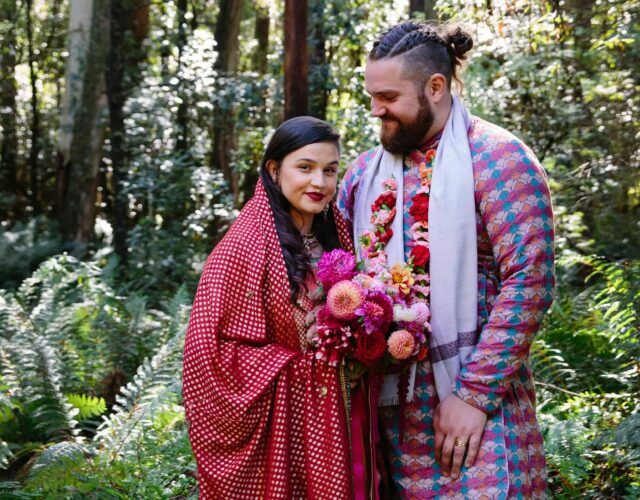 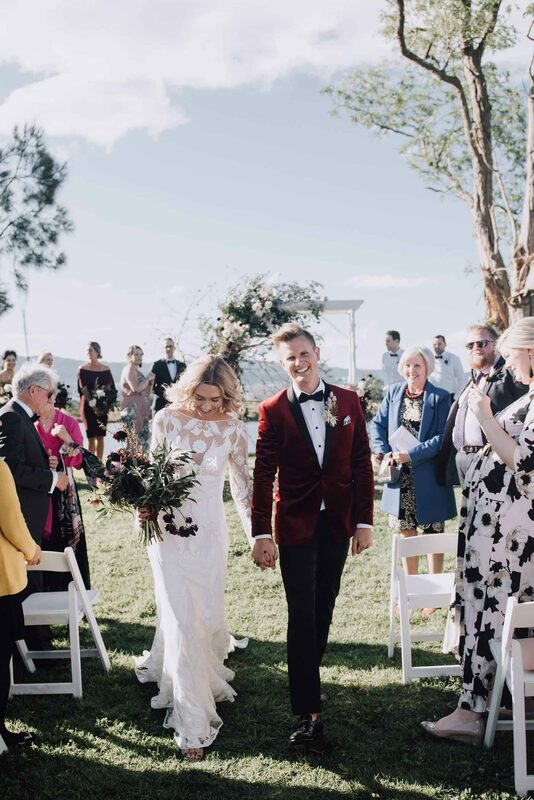 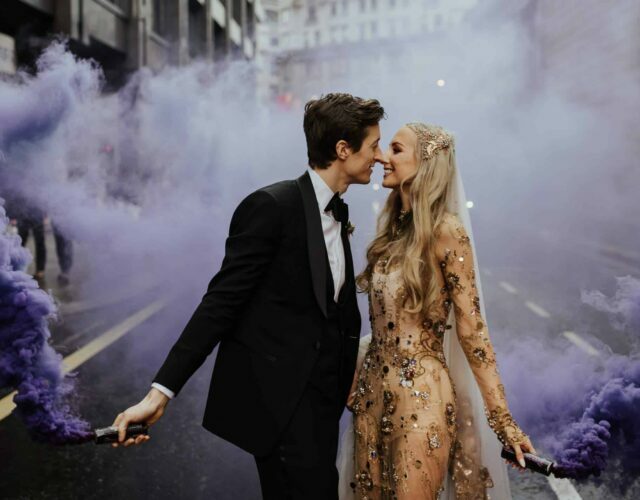 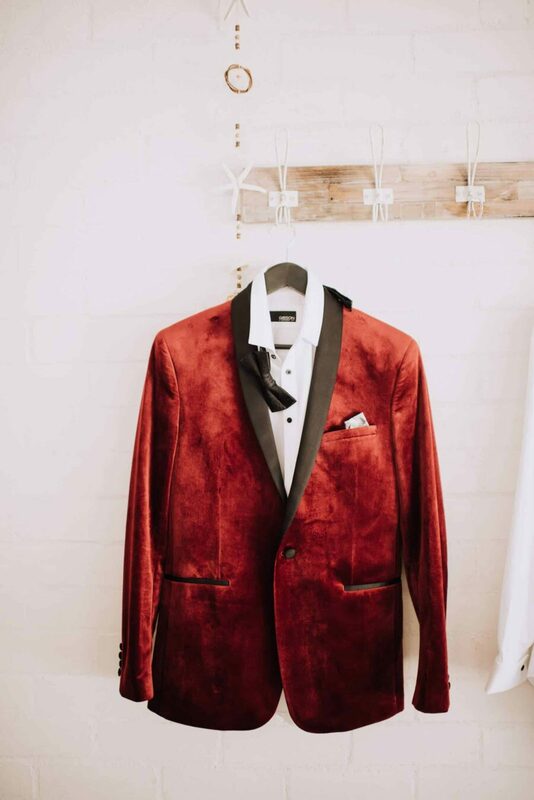 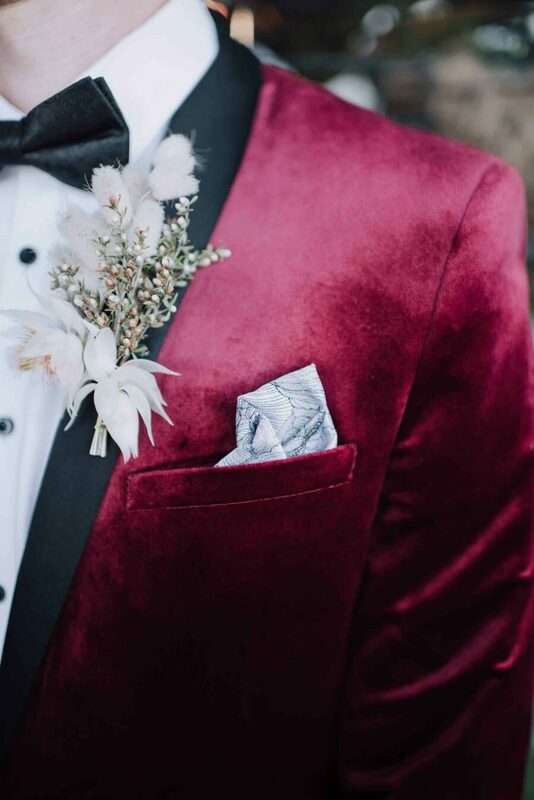 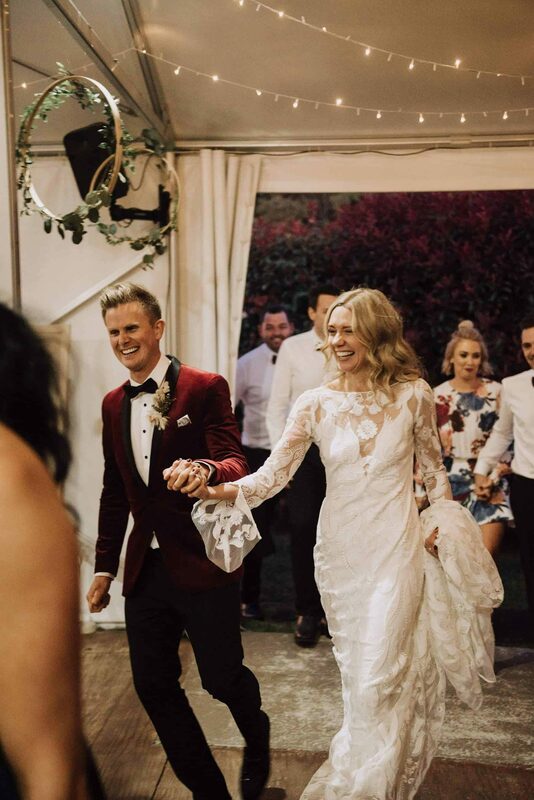 Liz chanelled bohemian romance in a long-sleeved, low-backed Rue de Seine gown, while Justin looked sharp in a burgundy velvet jacket from Politix. 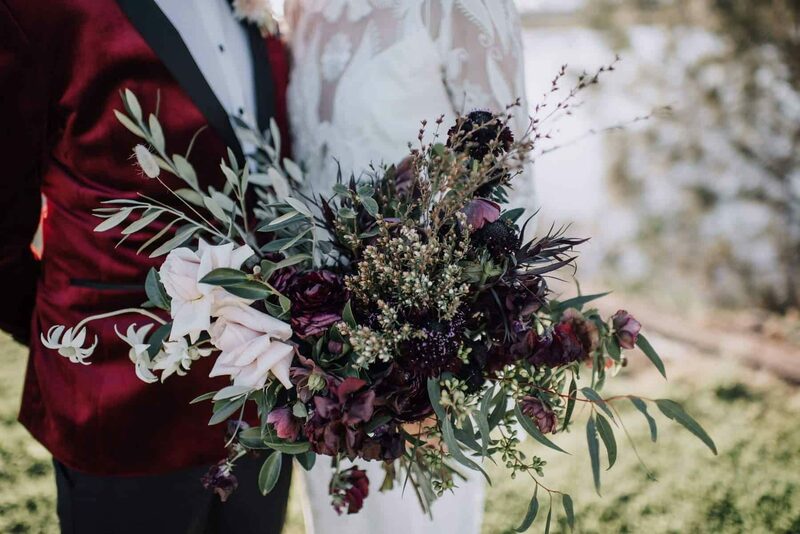 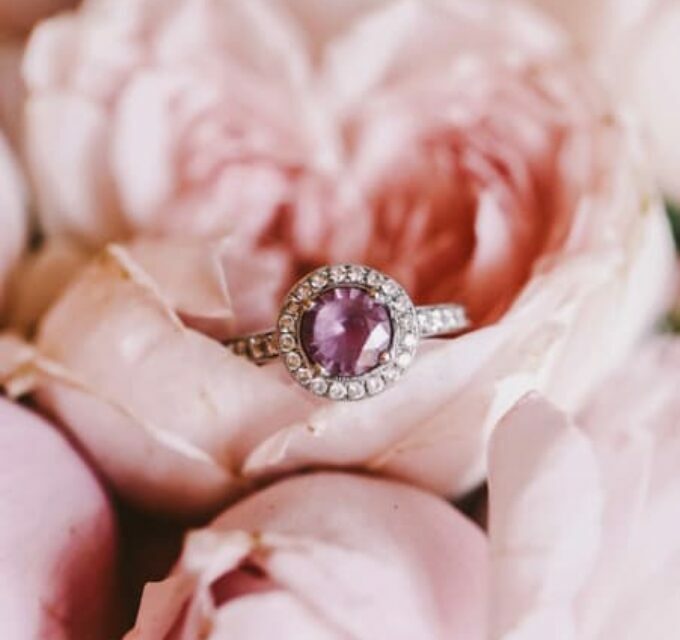 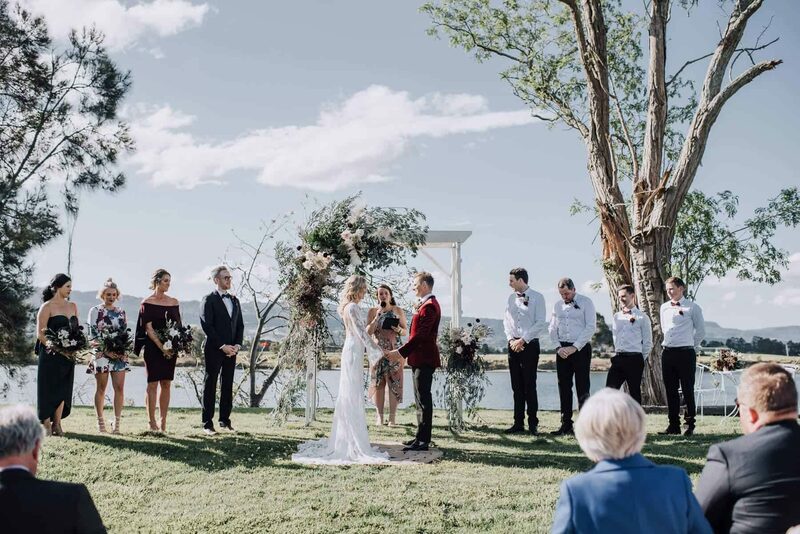 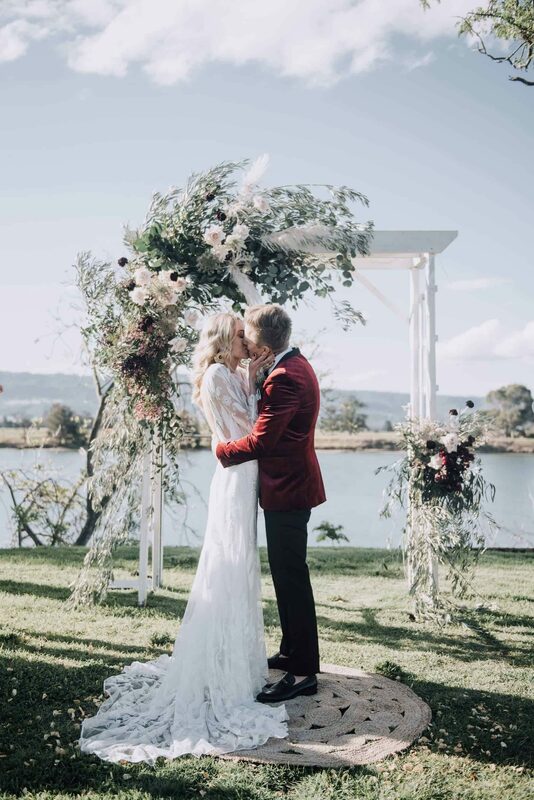 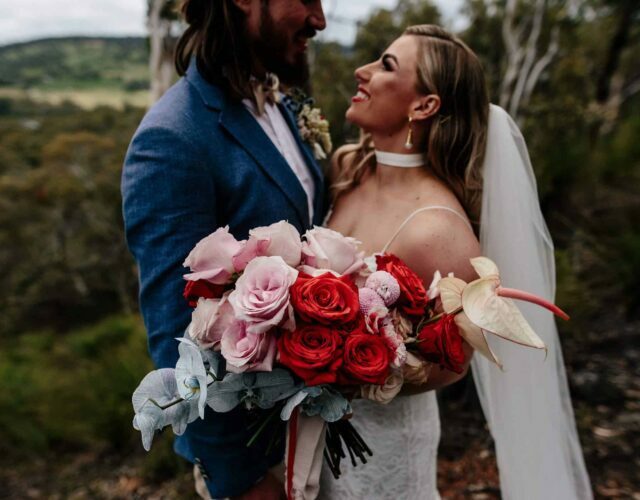 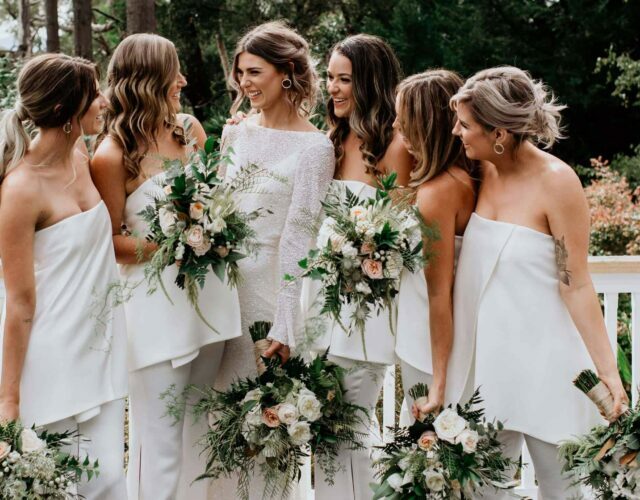 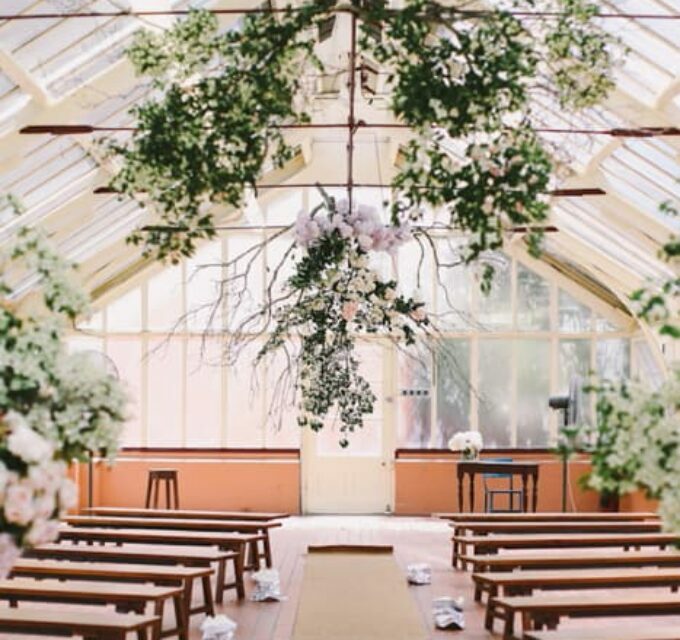 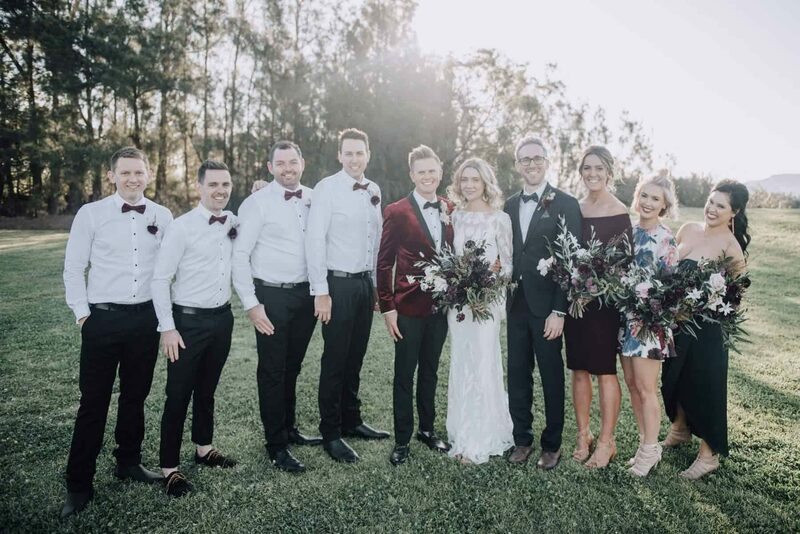 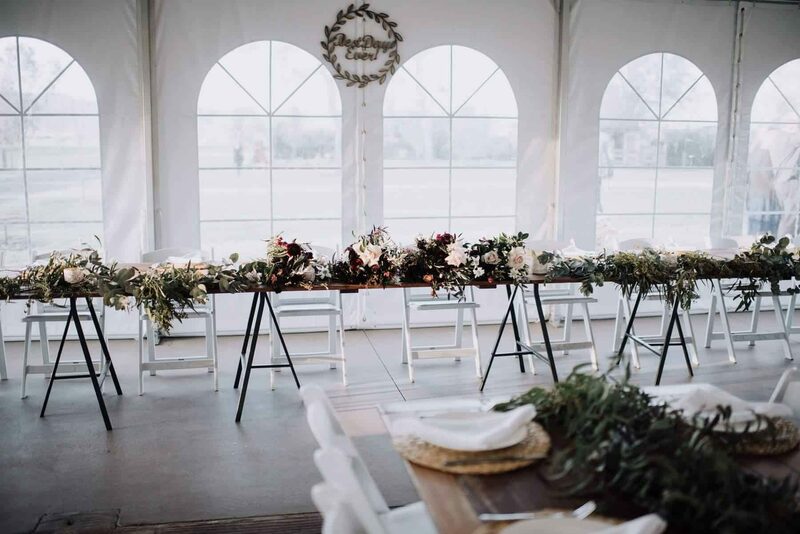 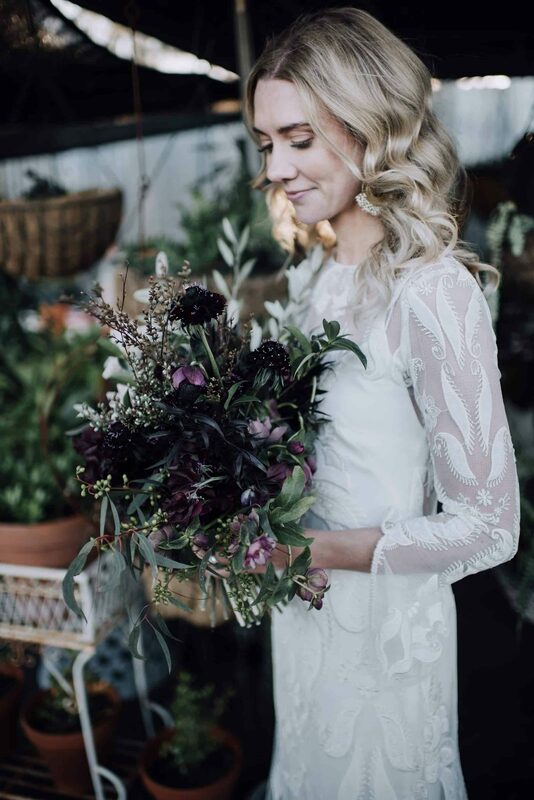 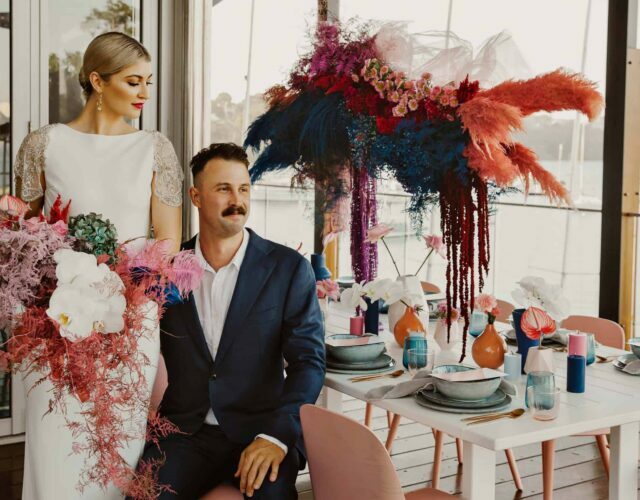 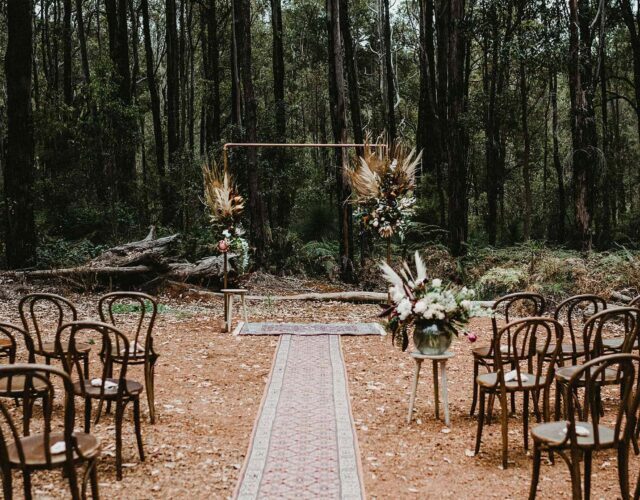 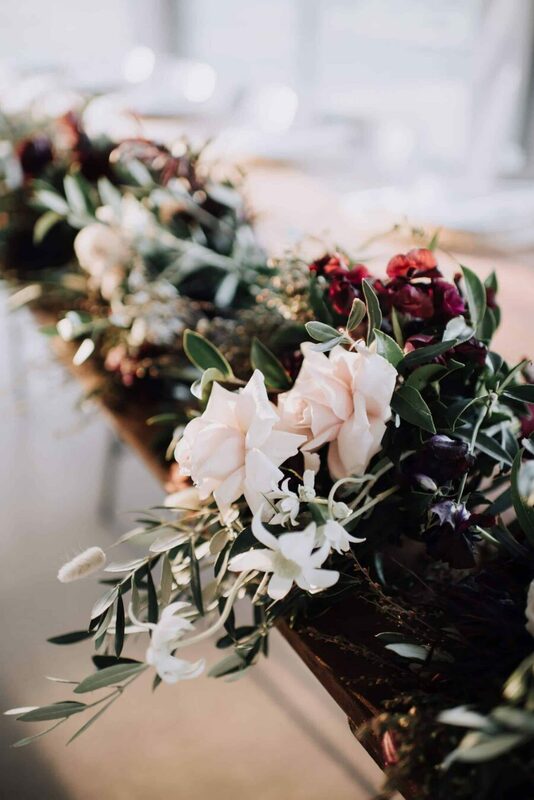 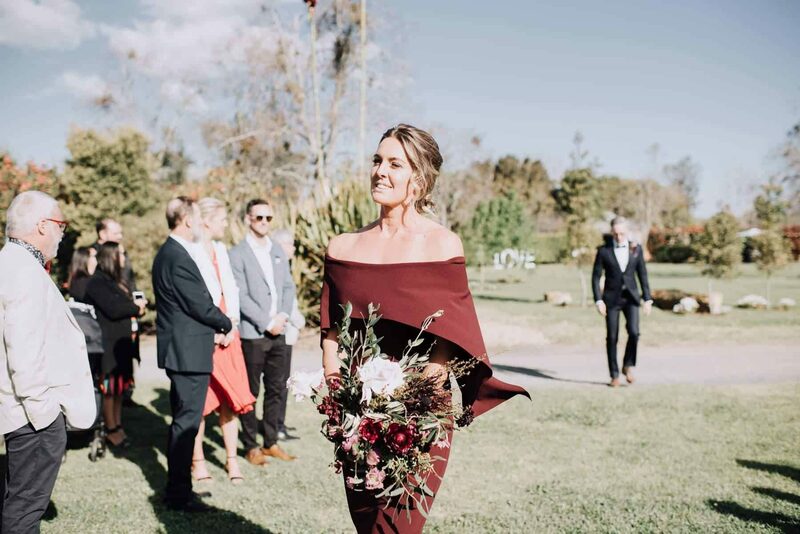 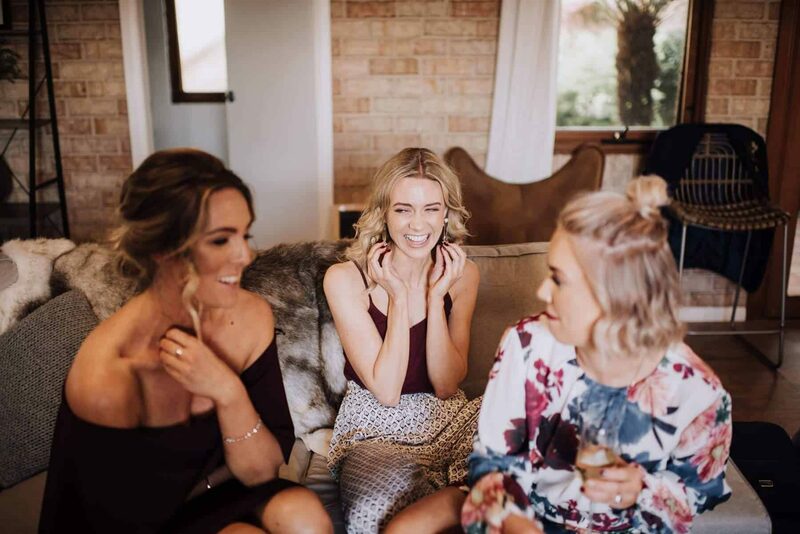 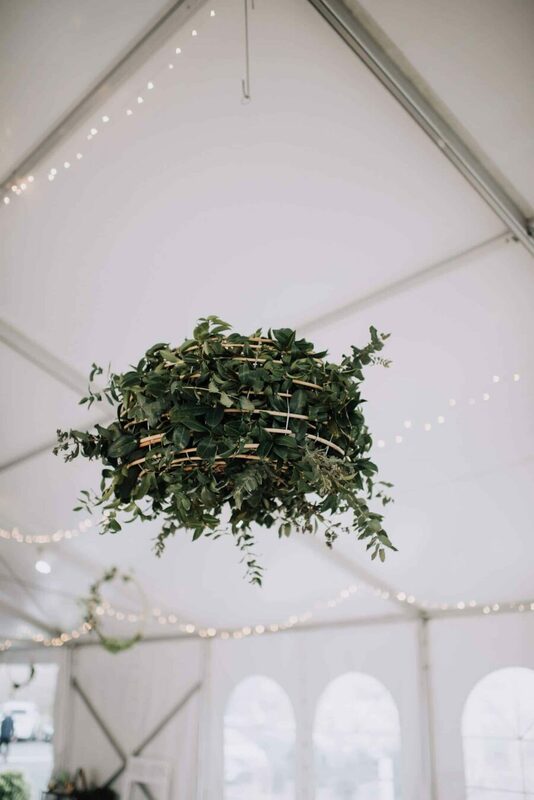 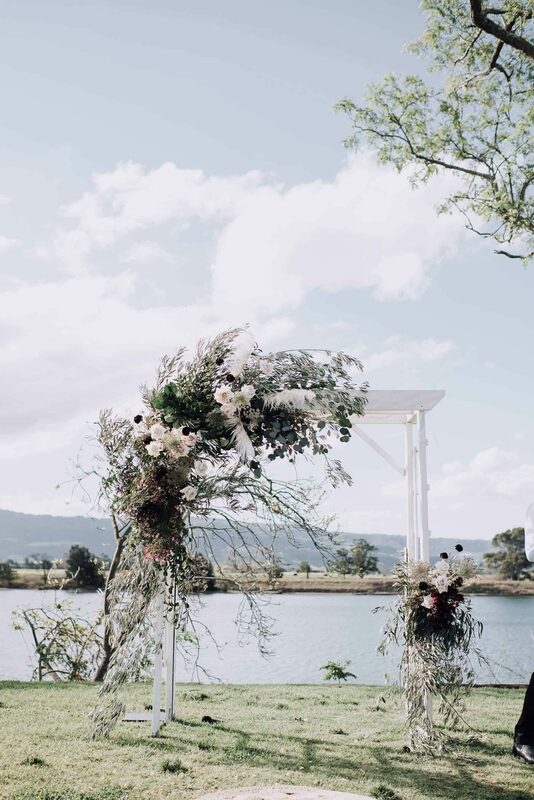 Sydney florist Redbud created a romantic floral arbour for the lakeside ceremony and wild bouquets in a deep plum and blush palette. 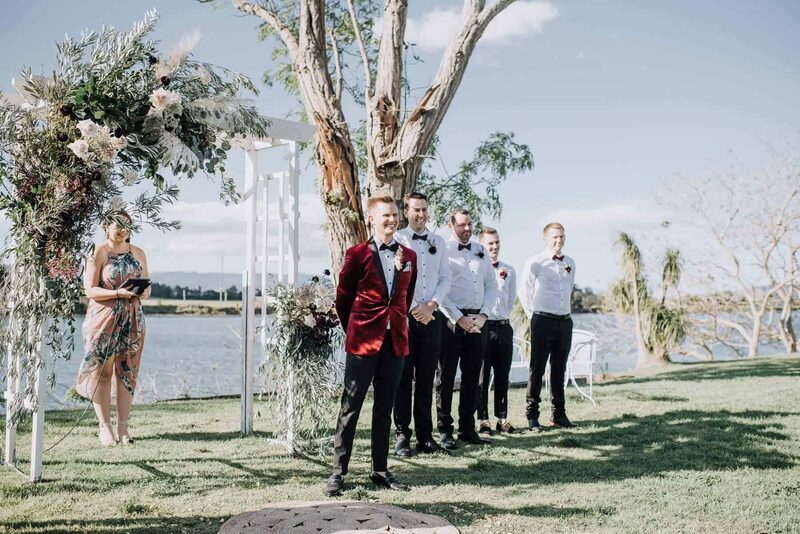 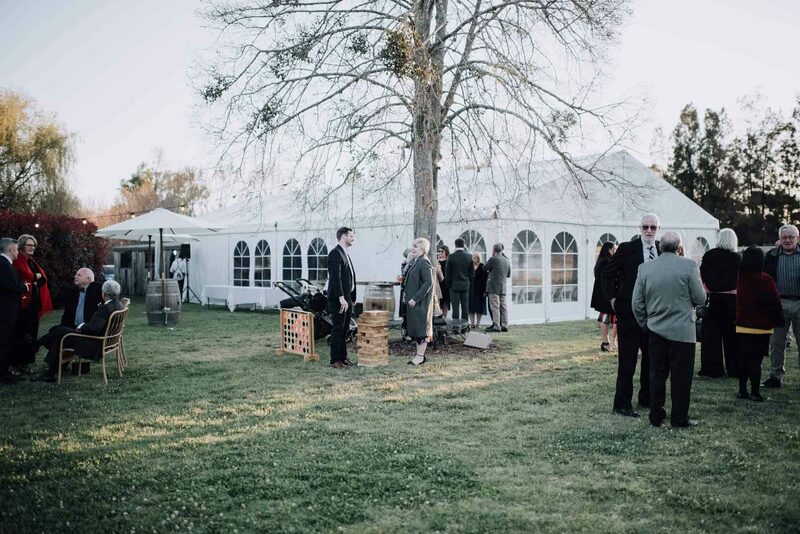 After the I do’s (officiated by celebrant Merinda Richardson) guests played lawn games and enjoyed cocktails and a grazing table whilst the newlyweds disappeared for some photos. 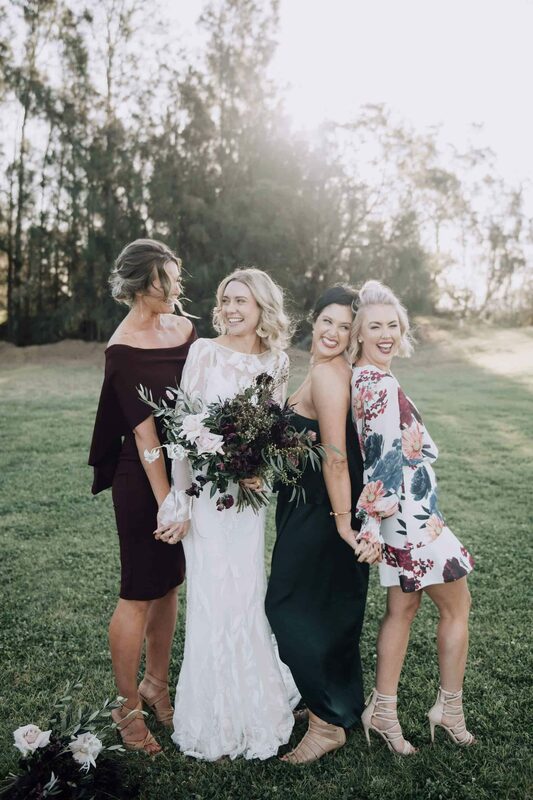 Perfectly mismatched, Lizzy's bridesmaids wore different dresses from Sheike, Pasduchas and Shona Joy in a burgundy and navy palette. 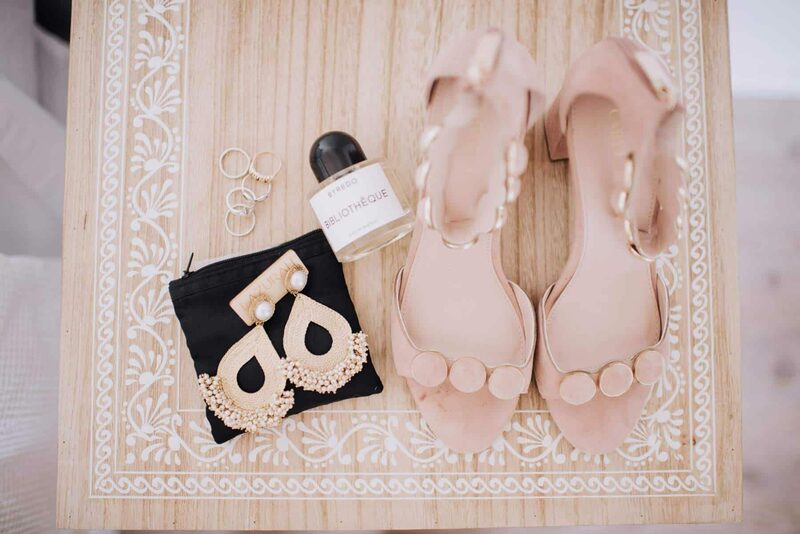 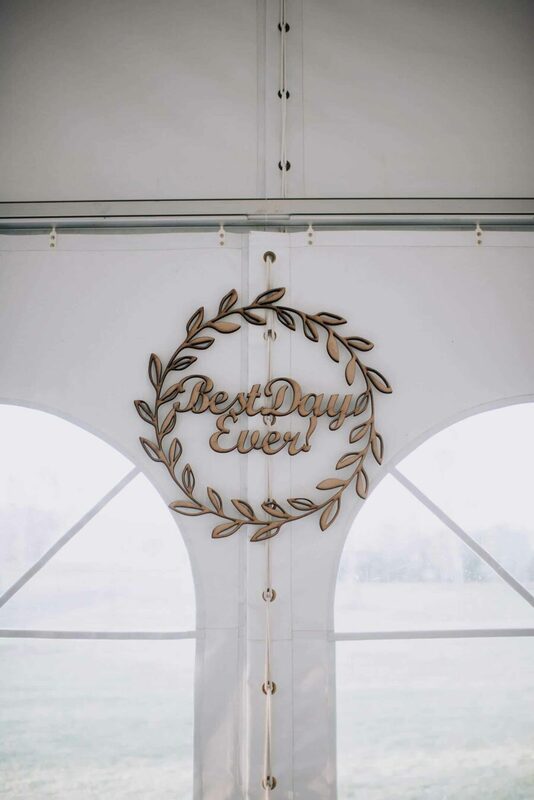 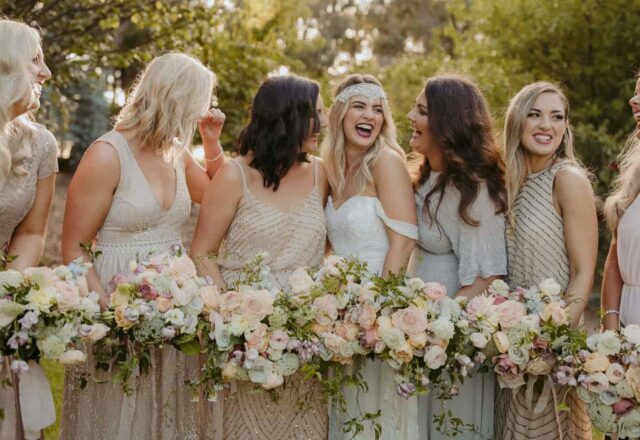 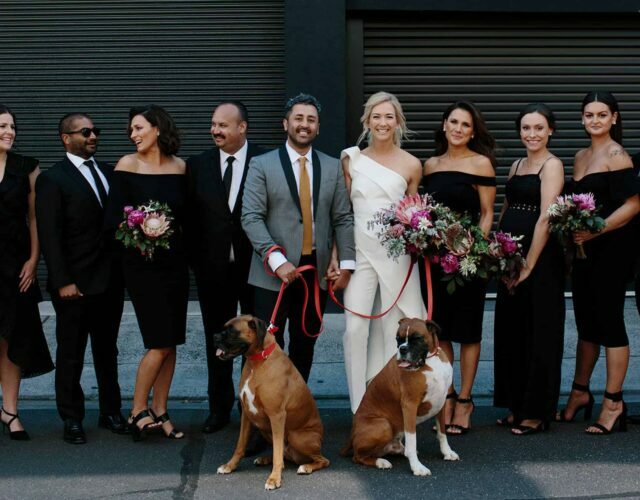 "My brother was also part of the Bridal Party," Liz explains. 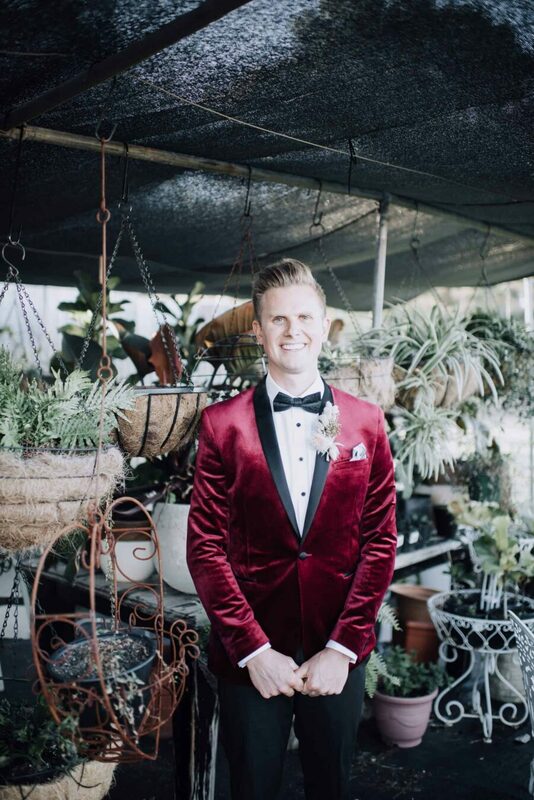 "He wore a navy suit and floral bowtie and pocket square, to tie in with the girls." 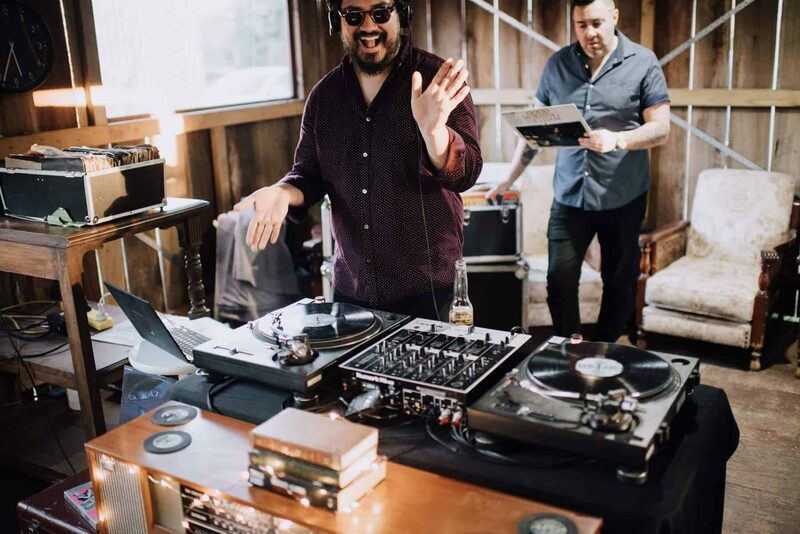 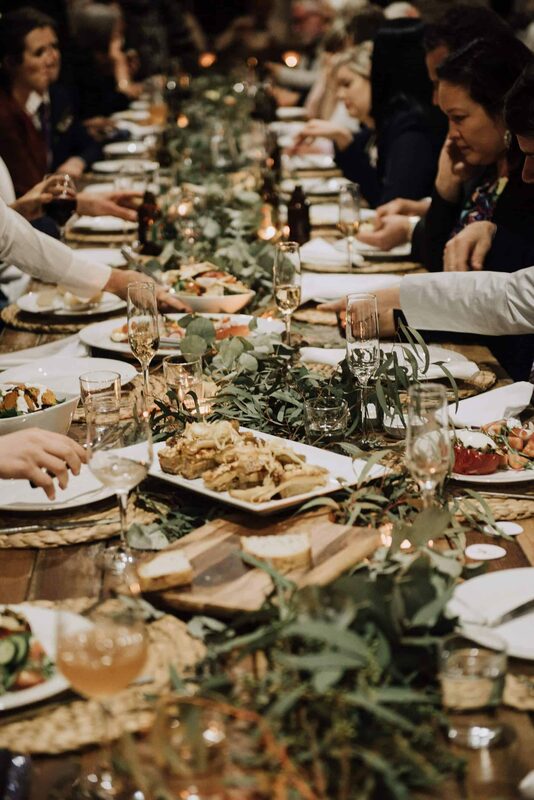 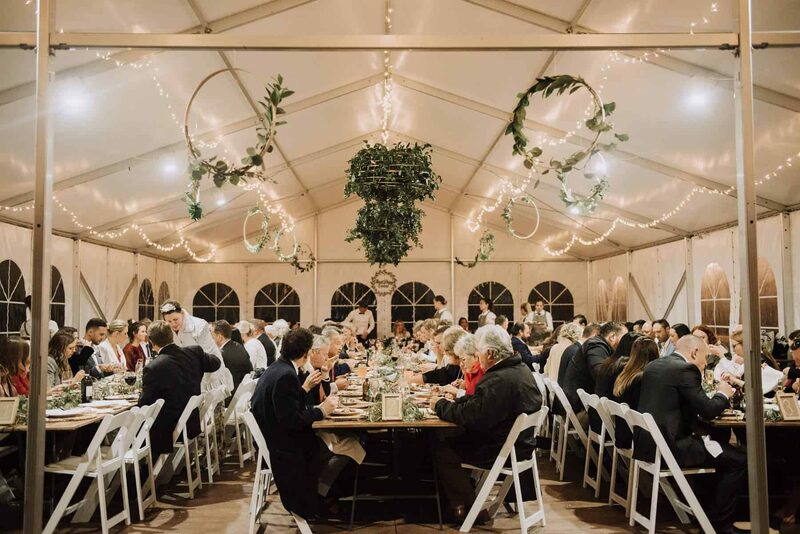 Rabbit & Co Caterers dished up generous share platters of smoked ocean trout, pork belly, and beef cheeks, with sides of roast potatoes, tahini pumpkin and fattoush. 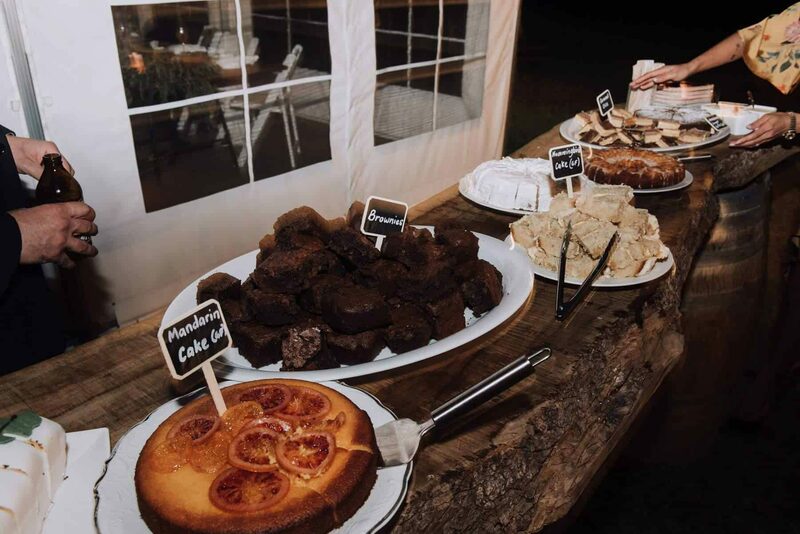 Guests finished off with a homemade dessert table instead of wedding cake.